Today in 1889 female journalist Nelly Bly began her successful attempt to circumnavigate the globe in 80 days. She beat it by eight days and back in 2004 I beat it by ten days. To be fair technology in the 115 years between our voyages might have made my trip a little bit easier. As per Instagram it seems that Thursdays are Throwback Thursdays these days. 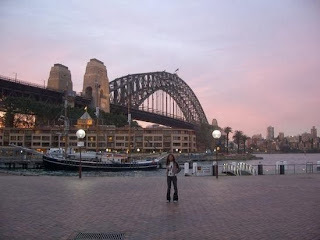 So as a result I visited my very first blog...my travelpod blog about my trip around the world. What a trip down memory lane! I suppose then I'll share some snaps. Between my London departure and return, my journey included surfing in Bali, museums in Melbourne, snowboarding in New Zealand (inevitable injury included), suffering from the flu in Sydney, beaching in Hawaii, loving Los Angeles, losing money in Las Vegas, locked in Alcatraz in San Francisco, mooching around Miami and burning around Bermuda on a moped. Beautiful memories were made. Celebrating my past today and the future adventures to come. I don't know what's considered a milestone in the blogging world, but today I noticed I've had over 20,000 views of my blog, which seems pretty incredible to me. I've received nothing but support over these last two years of chronicling my journey on this path called life and I have you readers to thank for that. As an homage to posts past I'm going to revert back to the old format. Music. Fact. Quote. All related to numbers.